High Sound Quality Circuit Design Based on the ToP-ART (Total Purity Audio Reproduction Technology) Concept ToP-ART Design and ART Base ensure optimum sound when processing and transmitting the audio signal. The signal is simple and direct, therefor it is less likely to be affected by noise and distortion. The left and right channels are organized in a straight, symmetrical layout for the highest signal purity. High Strength Chassis Contributes to High Density Sound and Pure Audio Reproduction In order to effectively dampen the vibrations that have adverse effects on sound quality, the A-S801 chassis has a double bottom design with a 1 mm iron plate. In addition, the power transformer and heat sinks in the power amp section are supported by an extremely strong and stable ART (Anti-Resonance and Tough) base. A solid center bar further enhances high rigidity and dampens vibrations. These Yamaha design innovations contribute to superior signal to noise ratio with rich, natural sound reproduction. High Quality Parts for Outstanding Audio Performance Notice a custom made power transformer, custom made block capacitors, two direct signal path speaker relays, one point grounding system, extruded aluminum heat sinks and other top quality parts to effortlessly handle demanding audio conditions. The quality of each individual part, as well as how they work together, basically determines the sound quality of this component. Yamaha uses only very high quality parts, carefully selected and tested for their sound properties. USB DAC Function Supports Native DSD (2.8 MHz / 5.6 MHz) and PCM (384 kHz / 32-bit) Resolutions The USB DAC function supports native DSD (2.8 MHz and 5.6 MHz) and PCM (384 kHz / 32-bit*) resolutions. This function allows for a direct connection to PCs which opens the door to play back of the highest resolution audio content offered today. The Yamaha-developed USB device controller has its own master clock that eliminates PC jitter. The driver is a low loss, high throughput ASIO 2.3 Yamaha Steinberg USB driver. During playback, indicators on the front panel clearly show which sampling frequencies are currently being used.Windows supported. Mac support is 24-bit Exceptionally High Performance 32-bit D/A Converter After careful listening evaluations, Yamaha selected the 32-bit, 2-channel SABRE Premier Audio DAC from ESS Technology, Inc. Most notable is its high precision processing power of 32-bit audio along with the ability to handle large amounts of audio data with full PCM 384 kHz and native DSD 5.6 MHz. Since the built-in D/A converter generates its own master clock, an original jitter elimination function is also included, permitting D/A conversion with an extremely low impact of clock jitter. Moreover, a 2-channel D/A converter is housed inside the chip which applies a double differential operation. The result is exceptional high performance and high quality signal output with a superior signal to noise ratio. 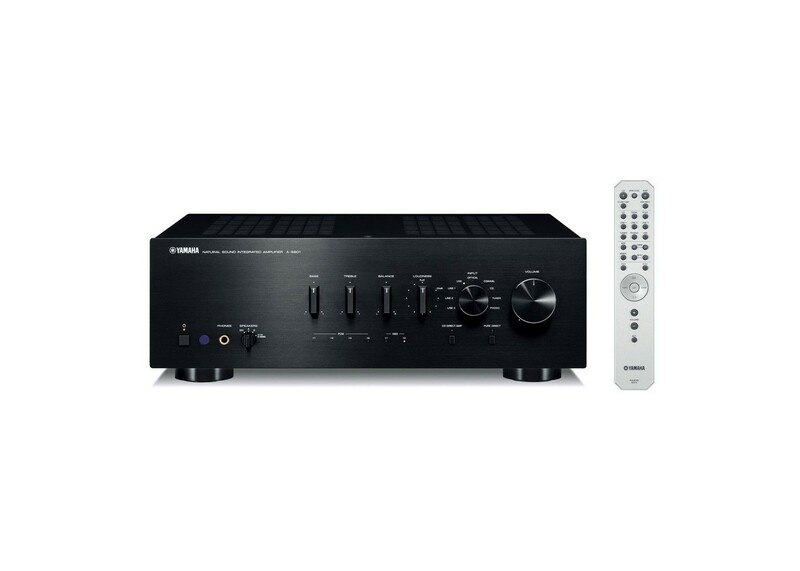 Digital Audio Input for TV and/or Blu-ray Disc Player The A-S801 is equipped for digital audio inputs with an optical and digital coaxial input terminal. The optical is for receiving audio from a TV and the coaxial for receiving audio from a Blu-ray Disc player. The audio stays in the digital domain giving you pure, pristine and dynamic sound for all your entertainment sources. CD Direct Amplification and Pure Direct Mode for Greater Sound Purity With a straight connection to the CD input, CD Direct Amplification maximizes the CD sources signal-to-noise ratio. Additionally, engaging the Pure Direct mode causes the music signals to travel the shortest possible circuit route, bypassing the buffer amp, the tone, loudness and balance controls to virtually eliminate any signal degradation for the purest sound quality. Continuous Variable Loudness Control The A-S801 also features a new analog loudness control on the front panel that uses electronic volume for higher sound quality which lets you adjust the loudness effect as desired. Separate from the overall volume, this controls the balance of the low and high frequencies providing full tonal range at any volume level by compensating for the natural loss in the human ear at soft levels. Gold Plated Terminals Gold plated terminals ensure a high quality connection that prevents signal loss. The A-S801 has gold plated speaker and input terminals. Speaker A, B or A+B Selection and Speaker Terminals for Two Systems You can connect two separate speaker systems and hear them in different rooms at the same time. There are four terminals, so by just rotating a simple selector dial you can switch between the two pairs of speakers to play the selected source. Subwoofer Terminal A terminal for connecting a subwoofer is provided, allowing you to increase the bass output of your system for a more powerful sound with better overall sound quality. Phono MM Terminal You can connect a turntable with a MM phono cartridge to play vinyl records. Get the best of both worlds whether listening to analog vinyl or the latest digital technology. Simple Yet Sophisticated Design With a beautiful, simple and unique design inherited directly from Yamaha Hi-Fi audio components, this amplifier also boasts an easy to operate layout. The aluminum front panel has a richly textured silver hairline finish. The control knobs are also of the same luxurious construction as used on our top end models. Remote Control with Clean, Simple Design The clean, simple design of the remote control provides easy to understand “one handed” operation. The design makes it simple to adjust inputs, volumes and more. The unit has a sophisticated looking hairline finish that matches the design of the amplifiers. You can also use the remote to control a Yamaha CD player. Rotary Encoder Input Selector with LEDs The rotary encoder makes it quick and easy to select input sources. The luxurious hairline finish offers a nice tactile feeling. LEDs clearly show which source is selected so you can easily switch sources, even in a dark room. Connection for YBA-11 Bluetooth Wireless Adapter With the YBA-11, you’ll be able to stream music wirelessly from a Bluetooth compatible mobile phone or a PC. Thanks to the digital coaxial connection and the aptX audio coding algorithm, you’ll enjoy wireless music streaming with optimum sound quality. You can also conveniently power the YBA-11 via the DC out connection on the rear panel of this amplifier. Auto Power Standby Function When Auto Power Standby is engaged the amplifier will automatically shift itself into standby mode when a user function has not been executed in eight hours. This a great function if you forget to turn the amplifier off and it will help minimize power consumption when the unit is not in use.